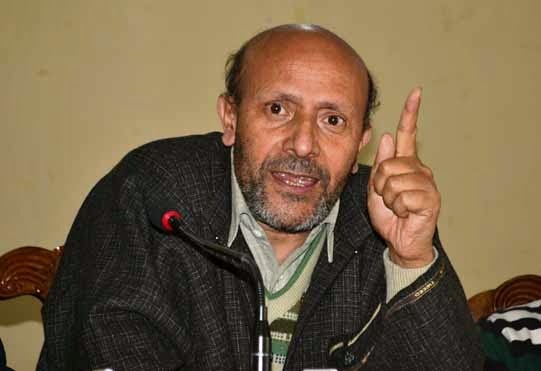 Srinagar : Awami Ittihad Party (AIP) president and Independent MLA Langate Engineer Rashid Ahmed stormed the Well of the legislative assembly on Wednesday to protest dropping of his resolution on Afzal Guru and was marshalled out of the house. Rashid Ahmed stood up from his bench and sought reply from the Speaker as to why his resolution demanding return of mortal remains of Afzal Guru to his family was dropped from the proceedings of the House. When he was told that it was dropped during the draw to select the resolution for holding discussions in the House, he walked into the Well of the House and resorted to protests by saying that if the Government of India can talk to Pakistan for handing over the body of Mumbai terror attack convict Ajmal Kasab, then why cannot they return the mortal remains of Guru to his family. He continued protests amid verbal duels with NC members, including Devendar Rana, and PDP members, including Yawar Dilawar Mir, interrupting the House proceedings during Question Hour. He also had a verbal duel with CPI (M) member M Y Tarigami. Speaker Kavinder Gupta said that there was a draw of lots in front of representatives of all the parties last evening and the resolution did not figure in it. As he continued to protest, the Speaker ordered marshalls to take him out of the House and he was accordingly marshalled out. Rashid alleged was deliberately kept away from the business of the House.